Economic recession in Russia has caused a sharp drop in domestic demand for the main product segments, forcing foreign investors who established production facilities in the country to change plans and focus on international sales to compensate for falling domestic demand. The fall in value of the Russian currency has reduced production costs in Russia, rendering Russian-manufactured products more competitive in the global market. Recession and the subsequent drop in domestic demand for major consumer products has forced foreign manufacturers to focus on and boost their sales outside Russia. A variety of markets is opening for products produced in Russia. Ford Sollers, a joint Russian-American venture producing Ford-branded cars, is planning to start exporting its vehicles to Europe. The company began supplying Ford Focus and Ford EcoSport models to neighboring Kazakhstan in November 2014, with plans to penetrate other markets. To reduce production costs, the company management decided to increase the share of components produced in Russia from 40% to 85%. In December 2015, the company will open a production plant in Russia to manufacture 85, 105 and 120 PS engines for Focus, Fiesta and EcoSport models respectively, with the projected productivity of 105,000 engines annually to begin with, and later, 200,000 engines a year. 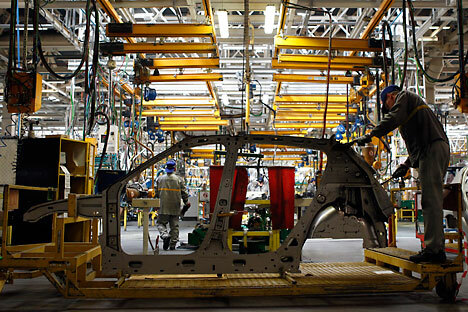 Ford plans to invest a total of around $1.5 billion to develop production facilities in Russia. Russia’s largest carmaker AvtoVAZ is, in turn, aiming to boost international sales of its most popular model Lada in 2015, seeking to export 100,000 vehicles a year. According to estimates of VTB Capital investment company, the domestic sales of AvtoVAZ will plunge by 17% in 2015, going down to 320,000 vehicles a year, while exports are expected to rise by 35%, to 70,000 vehicles per year. The increase in international sales of Russian-made vehicles is happening simultaneously with a sharp drop of domestic sales. According to the Association of European Businesses in Russia, sales of cars in Russia declined by 35.3% between January and July 2015, with 913,131 cars sold during this period. One of the main reasons for the growth of international sales is a reduction in the purchasing power of Russians, analysts said. The drop in demand is visible across all groups of goods. According to Russia’s Ministry of Economic Development, retail trade turnover dropped by 8% in the first half of 2015, with the demand reducing by 7.7% for foodstuffs and by 8.3% for other goods. According to a statement by Bosch, the company’s turnover within Russia was 652 million euros in 2014, or 8% less than 2013. Sale of Bosch refrigerators in Russia dropped 25% in 2014. The company predicts a further decline in Russian sales through 2015 and is prepared for it. “The Russian market remains quite large, and there is still a stable demand for durable goods here. Nevertheless, this demand has fallen significantly in monetary terms,” said Ilya Balakirev, chief analyst at UFS IC. Transferring production to Russia helps foreign companies to reduce production costs because of cheaper labor, as well as more affordable components available in some sectors. “As a result, companies are able to offer more competitive products both internationally and on the local market”, the analyst said. The more components a company produces locally, the better their position in the Russian market, with household appliance producers and carmakers doing especially well in the current climate. “Thanks to the relatively low need for complex electronic components and the relatively simple manufacturing process, both household appliances and car producers find it rather simple to manufacture most or all components locally,” said Timur Nigmatullin, analyst at Finam investment company. Consequently, foreign household appliance manufacturers operating in Russia are also able to increase production, aiming in particular to boost international sales. For example BSH; a subsidiary of BSH Hausgeräte GmbH producing Bosch and Siemens washing machines and refrigerators; is planning to double their international sales in 2015. In 2014, the company sold 50,000 Russian-made washing machines internationally. The bulk of the company’s export sales go to the member states of the Eurasian Economic Community (an economic union comprising Armenia, Belarus, Kazakhstan, Kyrgyzstan and Russia), and also reach some European nations, including Germany, France, Italy and the Scandinavian countries. By the end of 2015, the company will have invested 160 million euros in the Russian economy. Khakan Mandaly, CEO of the BSH Russian production unit, said the company produces up to 50% of components locally, by creating production capacities in Russia and buying them from members of the EEU. “The devaluation of the ruble in 2015 gave us an opportunity to sell more, and we are doing our best to make full use of it,” Mr.Mandaly said. Other manufacturers tend to choose the same path as BSH. Candy, an Italian household appliance manufacturing company, has begun selling products made in the city of Kirov (950 kms east of Moscow) internationally from spring 2015. By the next autumn, the company is planning to double the share of washing machines and refrigerators produced by the Kirov plant. According to a representative of Candy, about a third of Russian-manufactured Candy and Hoover washing machines are currently sold internationally, including in Europe, New Zealand, Australia and Japan. The company is also seeking to transfer a part of its refrigerator manufacturing facilities in the Czech Republic to Russia. In 2015, the number of washing machines produced by Candy in Russia is expected to increase by 50 per cent, reaching 300,000 units, and the number of Russian-made refrigerators rising 33 per cent to reach 60,000 units. This will allow Candy to double its share of Russia-based production, company representatives said.